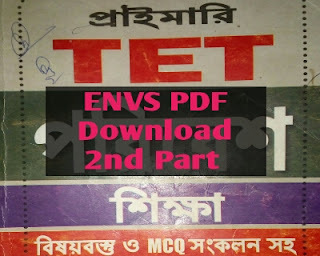 West Bengal Primary TET 2017-18 Study Materials download link provided here. Hope, you are quite well and daily practice for Competitive Examination, like ssc,wbcs,upsc,wbssc,ibps,ib,rail, clerk,police, primary,school servie etc. West Bengal Board Of Primary Education released there notice for vacancies. Most of the students wating for primary job. So, are looking for Study materials of primary Education? Here, is the best place for you. Today GK Solve share a most important pdf book for you. Environmental science is very important subject for primary Education. GK Solve share a Environmental Science pdf book below here. You can Download this book just one a click and free of cost.Details of pdf book and download link given below. GK solve helps you Everyday to give various Study Materials.If you help from the blog please share the blog Address to your friend circle. Disclaimer : GK Solve is not owner of this pdf book.GK Solve collect the book social media. GK Solve highly recommend to buy the Original book.This is for who not able to buy.